With a month to go until the next Atlantic 10 tournament champion is crowned, much is left to be decided. The A-10 is as tough as ever and could potentially send as many as four teams to the NCAA tournament. Yet up and down the league standings, plenty is yet to be determined as teams fight to earn bids and salvage seasons. With a month left in the regular season, let’s look at the top five storylines in the A-10 heading down the stretch run. The race for league champion has come down to St. Joseph’s, Dayton, and Virginia Commonwealth. Dayton sits a game clear atop the standings for now after VCU took a horrible loss to UMass over the weekend, but the Rams own a win over St. Joe’s from back in early January. All three will most likely make the NCAA tournament, although St. Joe’s sits solidly on the bubble, but all three will get to decide it, to some degree, on the court. Dayton travels to St. Joe’s on Wednesday and hosts VCU in the season finale on March 5. As of now, GW is the definition of a bubble team. Sitting just outside the bracket, the Colonials have had the type of up-and-down season that makes projecting their future a nightmare. 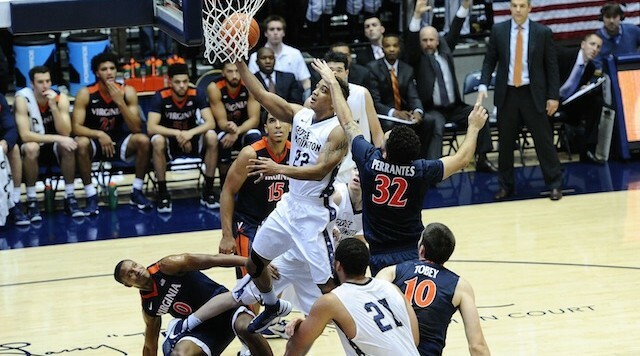 On the plus side GW has the ultimate good win for a bubble team: Virginia. The Colonials beat the Cavs back in November and that win has kept maturing like a fine wine since, and that’s nothing to say of their other three top-100 RPI wins. On the flip side though are the losses. GW has seven of them, and while three losses against top-40 RPI teams is nothing to be ashamed of losing to three teams 120 or lower is. The black eye is a 65-62 loss at against a St. Louis team that’s not even in the top 200. Worse still is that the average RPI of their six remaining opponents is 124. GW does have two games against top-100 teams, they host VCU before traveling to Davidson to end the season, and might need to win both to make the dance. Go back a decade and there’s nothing but objective failure in the Fordham basketball program. The Rams haven’t made either of the two major postseason tournaments since 1992 and haven’t won more than 10 games in a season since 2007-2008. Well, that last part is actually incorrect because first-year coach Jeff Neubauer has the Rams sitting at 12-11 with and in the top-200 in the RPI. It’s a small, but tangible accomplishment, for a program that hasn’t seen many in recent years. All of the wins are against teams with an RPI 150 or above, but you have to crawl before you can walk and Neubauer as given the Rams hope for the future after just one year. Rhode Island’s season has been a series of what-ifs. What if star guard EC Matthews doesn’t go down with a torn ACL 10 minutes into the season. What if starters Kuran Iverson and Jarvis Garrett don’t get plagued by injuries after the new year? What if the team could consistently hit free throws? The Rams have been tantalizingly close to so much success this season. Rhody has lost 11 games, and 10 of them have been by single digits by an average of 4.4 points. The only double-digit loss was a 22-point blowout to Maryland on a neutral floor in November. The silver lining is that the Rams aren’t folding. The team is talented but thin. In a loss to Dayton on Friday night four Rams player 37 minutes or more while only one Dayton player played more than 31 minutes. With the return of Matthews next year, as well as six players from this year’s rotation including star forward Hassan Martin, the learning and growth of this season could pay dividends in a huge way next winter. It seems like an eternity ago when UMass last made the NCAA tournament. It was actually just two years ago, and the Minutemen were a six-seed led by the likes of Raphiael Putney and Chaz Williams. Now UMass sits 10-13 and 12th in the A-10 standings and are in danger of finishing with the worst record of the Derek Kellogg era at UMass. The Minutemen started the season 5-1 but fell off sharply after that punctuated by a seven-game losing streak in January. The average margin of defeat in those games was 12.7 points. It’s not like the cupboard is bare either. Trey Davis and Donte Clark provide an excellent one-two scoring punch averaging 18.8 and 17.6 points a game, respectively, but the results just aren’t there. Kellogg is a good coach, but the rebuild he has on his hands only gets tougher. Three of the top-four scorers on the team graduate this spring.